I've done some work on the enemy characters they'd been bugging me for a while because I couldn't come up with a good design, but these aren't too bad so hopefully you'll be fighting them! They use a similar method of aiming to the main character, the only difference will be that when firing they'll use the main character as the target instead of an empty(I think I explained this system in a earlier blog post). There's a couple of normal maps issues to be ironed out, but I needed to rig it before doing that. 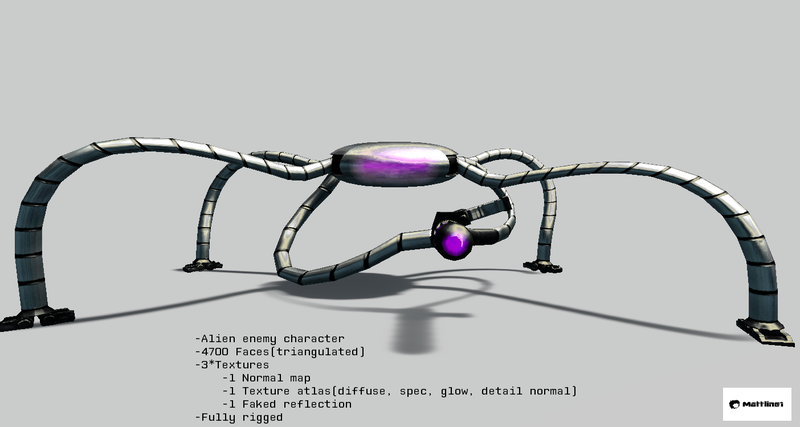 I did have to compromise with the rigs complexity, a lot of complex armatured objects tends to kill the frame-rate, so there's squashing/stretching on the legs and arms because they only use two bones (where they connect to the body and the feet). Had I only wanted two or three of these at a time it wouldn't have been a problem, but I'm thinking of having a lot of these things climbing around. Hopefully when they're animated and moving the stretching issues shouldn't be so noticeable!